This summer has been a whirlwind. Even though we've been a bit quiet on the blog front, we've been taking full advantage of our local farmer's market and enjoying cooking and dining outdoors as much as possible. I normally would add enjoying our garden to the list, however following a major security breach in our garden fence this year, let's just say our homegrown crops suffered major losses. The hot peppers are the lone survivors. One household with a killer garden this year is that of my brother and sister in law. Holy cow! 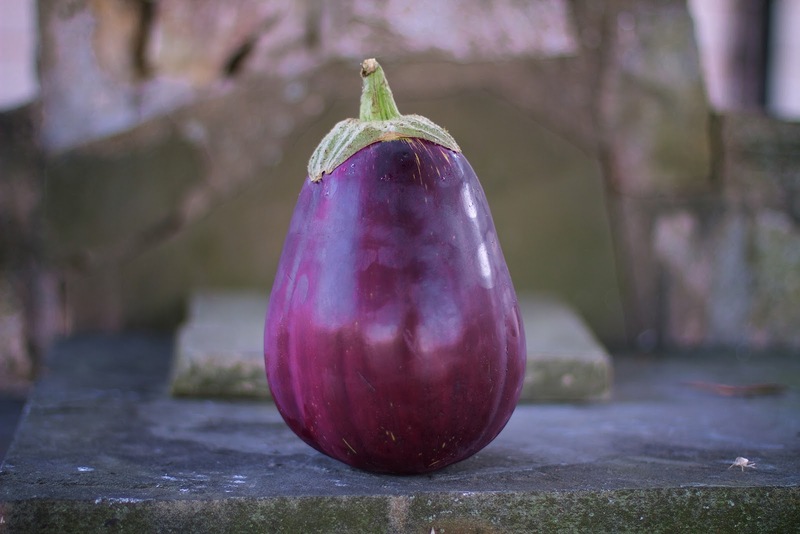 Even on a good year in the garden I have never been very successful in growing eggplants. Dave and Mary have monster sized plants producing some monster sized eggplants. The best part is that they shared a few prized picks with us. This recipe came about all thanks to them! Unless I'm making something like traditional eggplant parmesan, I don't bother salting and pressing eggplant. It's too much bother. I admit it, I'm a slacker. My motto is to keep it easy. Plus my favorite way to handle eggplant is to grill it and I find that method requires less fussy prep, but still delivers a delicious end product. There are a lot of parts to this recipe. Don't worry, because like I said, it's all pretty easy. You can get things going, pour yourself a summer beverage, and just sip away as you move through it. Our method for smoking with wood chips is based on using a charcoal grill. It's also a slacker method - no special smoker box or pan. It works, but please be careful. And, if you use a gas grill you'll need to research the proper method for using wood chips. Heat a saucepan over medium heat. Pour in the olive oil. Once the oil is warm, toss in the onions. Cook until slightly translucent. Add in the garlic and tomatoes. Season with salt and pepper. Stirring occasionally, bring the mixture up to a boil. Once at a gentle boil, reduce heat to low and cover. After 20 minutes, check on the sauce and toss in the fresh basil and cooked beans. Let sauce simmer for another 10 minutes. Then, keep over low heat to keep warm. Take a handful of hickory chips and soak in water for 20 minutes. Cut the eggplant into 1/2 inch thick slices. Season with salt and pepper. Brush with olive oil. Once the grill is heated to medium, arrange the coals into a flat layer to create a consistent heat. Strain the hickory chips and sprinkle them over the hot coals. Wait until the smoke starts, then place the grate onto the grill. 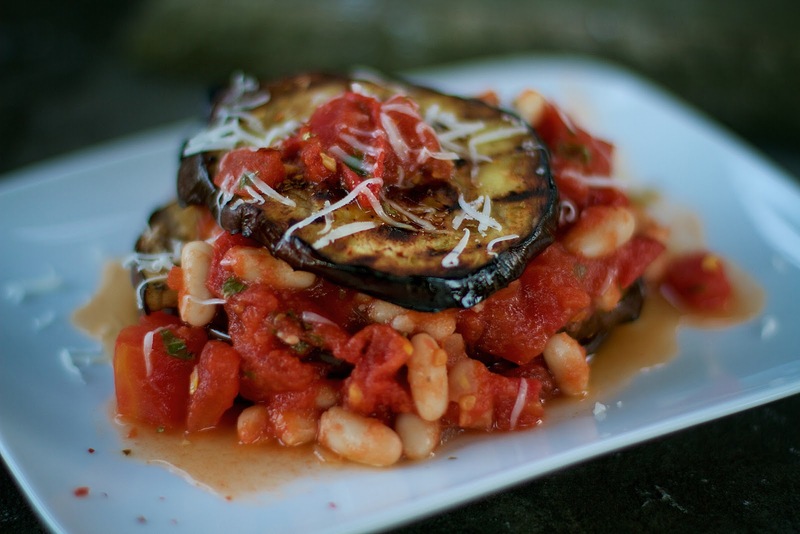 Place the eggplant slices into a single layer on the grate. Cover and cook for approximately five minutes, when the slices easily release from the grate, flip, and cook for approximately another five minutes. You want the slices to be tender but not falling apart. Continually check on the eggplant slices to make sure they are not burning. Slices may cook faster or slower depending on your grill. 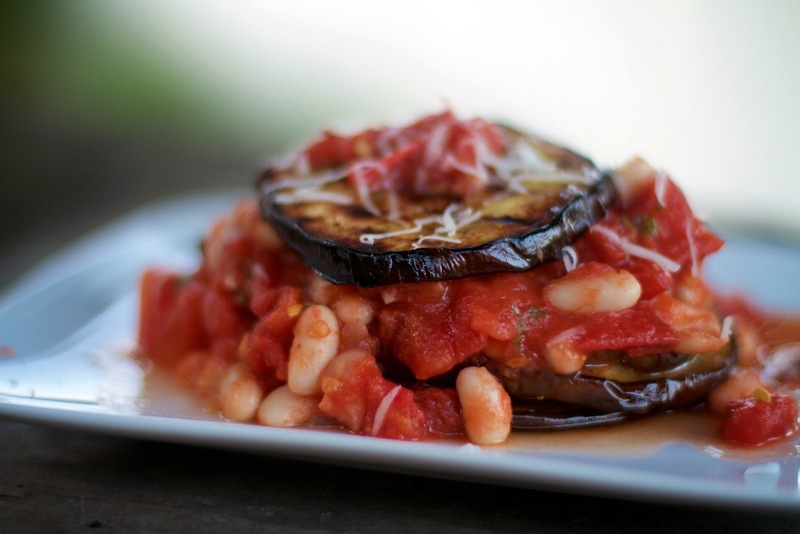 Place a few eggplant slices on each plate. Top each serving with sauce and beans. Sprinkle on hot pepper and grated pecorino romano cheese.